Michael Poole is LIVE blogging all this weekend from Royal Caribbean's Empress of the Seas. Follow along for the updates! What a day I have to share with you on this live blog. I started out my day in Tampa, Florida and drove to Miami at 6:45am. Nothing really exciting about the drive other than it is really long, around 300 miles. I arrived to the Port of Miami around 11:00am, and we were dock in terminal “G”. The parking at the terminal is $20/Day and you pay once you leave. I must say I have never parked so close to a cruise ship in all my cruises. Going through the pier was so easy, there were zero lines on both suite and non-suite side. I was handed my SeaPass card and excited to see I had the drink package sticker loaded on my card. I have the ultimate package that includes coffee and fresh juices, along with all the cocktails and beer. They had already started boarding so I walked right on board. At 11:30 the Windjammer was open and we made our way to lunch. The first thing I noticed is they have hand washing stations once you walk in. This was something different I have not seen on any other Royal Caribbean ship, but I really liked that home feeling. For lunch it was the typical lunch with burgers, fries, grilled fish, and ribs. I grabbed a seat by the window, but boy was it hot. That seemed to be the theme for today, just hot on the upper decks. The décor in the windjammer was all brand new with very modern finishes. After lunch we explored around the pool deck, the room was not open until 1pm, so we really took advantage of our time around the ship. They had pre-arranged a photo in the Centrum at 1pm. Shortly after I headed to my cabin, which is a Jr. Suite 9122. The cabin is what you would find on a standard ocean balcony across the fleet, but remember the ship is 26 years old. I was actually very impressed with the cabin and the space it offers, again with all new décor. After muster drill, we headed to the private crown and anchor top tier party and suites. They hosted this party in the aft of the ship on the open decks. They had a live band, plenty of food options, and drinks, very nice party. In fact, the Captain even showed up and was quite nice to talk to. Tonight our dinner was in the Chops Grill specialty dining. They charge a cover charge of $30 per person, and everything is included. Tonight we had a limited menu since our group was over 21 people. However, they had the favorites on there, such has onion soup and filet. The restaurant was closed off to our group, but had around 20 tables with ocean views. I went with the French onion soup and filet, which was outstanding. They bring the sides out family style for everyone to sample and refill as needed. Wow, this ship is truly beautiful, on the inside and out. I could not believe how nice she was, with the décor all brand new. The air conditioning works great all over the ship, yes it was hot this afternoon but it broke 100 today. The Voom Internet seems to be working fine and the staff all seems very happy. Honestly, I cannot think of any reason I would not book Empress of the Seas for a future cruise. Tomorrow we are in Coco Cay. We have some fun adventures planned there! Hi friends, Michael Poole here again for another live blog! This time I will be sailing on the newest ship in the fleet - Empress of the Seas. Well, she is actually the oldest ship in the fleet, but the most recent addition to the fleet. Empress of the Seas was recently added back into the fleet in May 2016 from their sister company, Pullmantur Cruises. There are many speculations on why Royal Caribbean brought Empress of the Seas back in the fleet, to soon be their Cuba sailing ship. Why Empress of the Seas? To be honest, since Royal Caribbean first announced they were bringing Empress of the Seas back into the fleet I have wanted to sail on her. In fact, I almost changed my March back-to-back cruise over to the Empress, but I decided to stay on the Brilliance. Empress of the Seas is a smaller ship, which I tend to enjoy more. The décor on the ship is all brand new from her recent two-month dry dock. The ship offers daily brunch in the Main Dining room with complimentary mimosas or bloody marys. Empress of the Seas is going by the slogan: Party. Chill. Repeat. Three weeks ago, I received a phone call from Royal Caribbean extending me the invite for this sailing. They have also invited some of their top-tier Crown and Anchor members, along with some social media bloggers. Needless to say, I was absolutely ecstatic when I heard the news! Anytime you get to cruise with Royal Caribbean it’s exciting, but to sail with their social media team too! They have some pre-arranged events during the cruise, but I want to keep those a surprise! I just know this is going to be a very special cruise, and I’m so excited to share it with you. 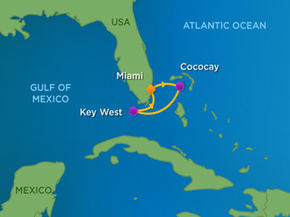 For this cruise we are sailing to my favorite stop in the Caribbean, Coco Cay. This island is owned by Royal Caribbean, and offers a relaxing beach day. Thanks for joining me for another live blog; I’m truly excited to take you all along with me again. I will be conducting daily periscopes of the ship, so be sure to follow @mpoole3 If you have any questions about the ship, or during the live blog, please comment below and I will respond.